Home Lifestyle Hacks for Living a Happy Life What is Catering and How to Choose a Catering Company? Catering services these days – it is a high-quality restaurant catering, which includes all kinds of service options from the planning and coordinating the many aspects of any particular event to cooking and meal serving. Ordering an outdoor catering – an exclusive service that provides a high standard service in any locations indicated by the client. The caterer can provide the necessary facilities for your event anywhere: on the board of an airplane and even on the deck of a yacht, it all will depend on the budget and your imagination. Also, a caterer can offer you the services according to even a small budget. It still can be a great variety of options, that may include a small range of services, for instance – waiters serving drinks only. Festive events are usually organized with the help of catering company focusing on this kind of events. Wedding Catering – it is one of the most popular catering services, especially in the summer. Coffee-Break is also one of the most popular kinds of catering, usually organized during training, workshops and other types of business events. It usually lasts more than 30 minutes, and the menu includes mostly only coffee, tea, juices and mineral water and light snacks. Lunch is also one of the options for business catering services, which is lasting longer in time. The usual lunch can be organized in the cafe, restaurant or the office. A catering menu may include several types of appetizers, salads, garnish, dessert, and fruit. Besides, you can order soft drinks and juices. A Cocktail Party is another popular form of catering service. It can be an exhibition, a book presentation or other kind of the social events. Interesting and often liked by many companies the kind of catering service – Outdoor Catering or a Barbecue. The main course on the menu is usually a fish and meat, as well as vegetables. Another version of outdoor catering is called a Buffet Catering. The serious kind of catering service is a Banquet. As a rule, it requires a thoughtful menu, careful organization and planning, and an exceptional preparation. Guests may be seated at one big table or the separate small tables. For all the guests be provided a personal menu and a personal waiter for every guest. Let’s talk more about the benefits of hiring a catering company. First of all, it is an efficiency of work and saving time. This is especially important if the enterprise is located in a remote location and is away from the public catering or does not have an opportunity to organize for a separate food block. Beauty, uniqueness, and a comfort are, perhaps, are the main features of any catering. 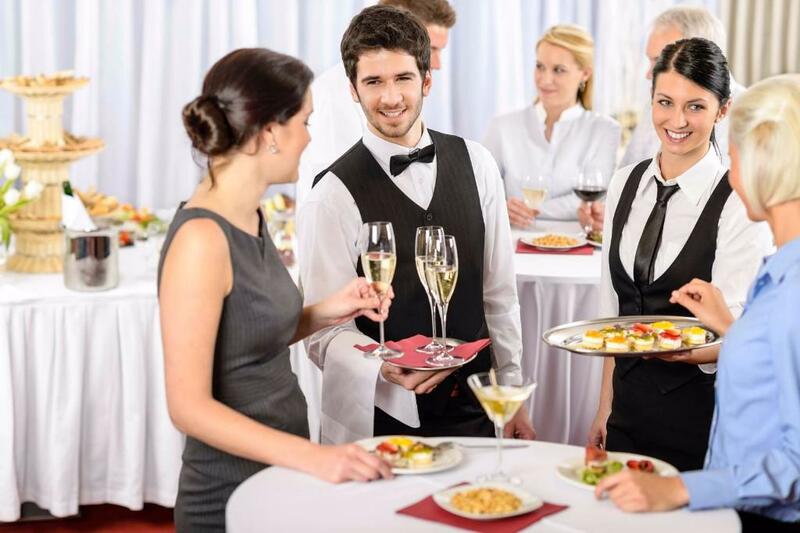 When ordering catering service, you receive not only the furniture, food, drinks and meals; In a complex of services, it is possible to include waiters, bartenders, a show program, the hall decoration with flowers and much more. Catering extends your possibilities. With a right caterer, you will have way more options when conducting different thematic, festive events, and celebrations. What If you do not want an ordinary wedding in the hall, with a standard toastmaster and boring contests. Then you can have a special celebration outdoor, for example, why not to have your special ceremony by the river? You will see that everyone will like this and the ceremony will remain in your memory for a long time. Planning to spend an awesome corporate party or birthday celebration? Do it in the country house – delicious food and first-class service are guaranteed to you. All this smoothly leads us to the fact that the main feature of this service is mobility. Mobility – is precisely a unique feature that provides all the right emotions and unforgettable experience. All you need is to find a good catering company that will be able to bring to the reality all your expectations.